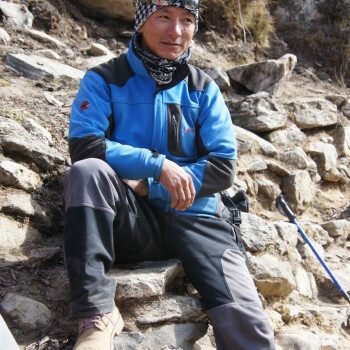 Mr. Rinji Sherpa works as a trekking guide, climbing sherpa & head cook. He was born in a traditional mountain village in the Okhaldunga district of Nepal. He has got many years experience in trekking field in several Himalayan regions of Nepal, Tibet and India. He used to prepare delicious outdoor meals during the trekking. He has involved in the various expeditions, trekking destinations and many more trekking peaks and Mountains in Nepal. He is well trained Trekking & Mountain Guide for the company. He does the work with more safely and seriously. He always thinks to give good Knowledge about the trekking. He plays a vital role to run a office for the Trekking. He always thinks a good service and service to the clients. We are very proud to have a good Guide & cook like Rinji.